Temari Addict Australia: On the road again. This week has been one of those weeks when jobs get started but not finished. I have lots of different things that need to be done (all of equal priority) so instead of knuckling down and doing these things I drove to Collie on Monday and Dwellingup* on Tuesday. Actually these road trips do meet a goal (getting the odometer on our car to meet our tax obligation) but it is also nice to be in a cold car on a hot day. Collie is a small timber and mining town a few hours south of Perth on the inland road. I guess I had been there as a kid, because my Grandmother's sister lived there with her family so it stands to reason we would have visited there. 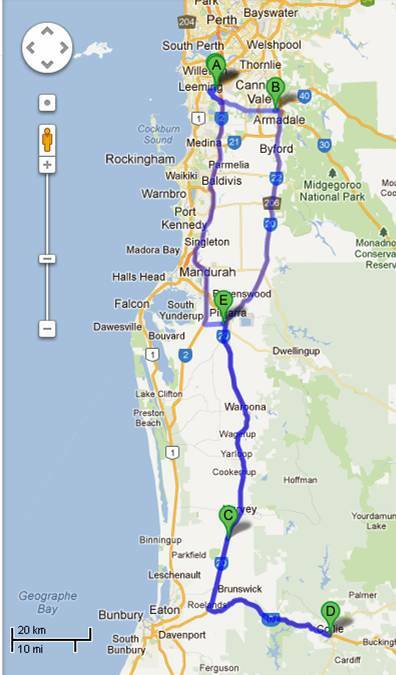 Collie is about 2 hours (200km) from Perth down South West Highway. The drives were quite pleasant with very little traffic (not even one Police car to be seen on Monday) so I got to drive almost all the way with my cruise control running. The countryside seems to be overrun with orange and black butterflies (Monarch) right now. They are simply unavoidable and sadly there is powdery evidence on the car grill that I smashed a few of them in my travels. I saw several closed down craft stores on the way which made me feel a little sad but also led me to wonder if crafting is dying out in these townships or are people just buying more online/when in Perth. I saw a church spire as I drove into the valley that is home to the township of Collie and decided to drive around until I found it. It is decidedly flash for a township of about 7000 people. Click the picture to see the stained glass panels. Just lovely. I think we might need to take an overnight trip back to Collie to explore the area a bit more. Harvey and Brunswick (on the way to Collie) are in dairy country, most of the area is still fairly green despite the long hot summer we've had. I saw some interesting sights along the way including a most unexpected Camel grazing in a paddock by the road. I stopped to take this picture of cows going to the Brunswick show. Classic! 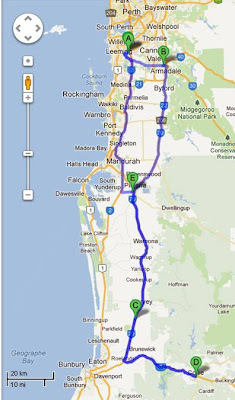 * Dwellingup is the tiny township just South East of the E in the map. Full of glorious large timber forests and one elusive raspberry farm that I will find someday.